Also serving communities of Oelwein. To help you with your search, browse the 1 review below for assisted living facilities in Sumner. On average, consumers rate assisted living in Sumner 5.0 out of 5 stars. Caring.com has helped thousands of families find high-quality senior care. To speak with one of our Family Advisors about assisted living options and costs in Sumner, call (855) 863-8283. Sumner is a small city nestled in the northeast corner of Iowa in Bremer County. Named after a respected U.S. Senator, the community offers the charm of small-town living with a healthy number of recreational activities for residents to enjoy. Seniors can stay cool in the donated aquatic center, find their favorite books at the local library or enjoy the wonders of nature on Sumner's paved walking or biking trail that runs from the City Park to downtown. Sumner assisted living facilities are referred to as assisted living programs (ALPs) and must provide housing and services to at least three or more residents in a home-like environment. Licensing for ALPs is regulated by the Department of Inspections and Appeals, Health Facilities Division. There are three ALPs to choose from in Bremer County. There are no public transit options or taxi companies in Sumner, so seniors without personal transportation will have to rely on arranged rides or on-demand ride apps such as Uber or Lyft. The cost of living in Sumner is lower than the national average. However, health care costs come in 20 percent higher than average, which can be a concern for seniors on a budget. Sumner maintains a climate with cooler average temperatures that may be uncomfortable for seniors who prefer the heat. January lows average around 9 degrees Fahrenheit, but July highs reach about 82 degrees. Sumner is considered one of the safest areas in the country with residents having a 0.1 percent chance of becoming a violent crime victim and a 0.2 percent chance of being a victim of property crime. The Sumner area has few facilities from which to choose in the event of a medical emergency or illness, with the nearest major hospital located in Waverly. Seniors in Sumner can take advantage of the many retirement-friendly Iowa tax laws available. Social Security income is not taxed, and the first $6000 of pension benefits are tax-exempt. Those over the age of 65 also receive a tax exemption of the first $24,000 of income and are eligible for a $20 personal credit. Assisted Living costs in Sumner start around $0 per month on average, while the nationwide average cost of assisted living is $4,000 per month, according to the latest figures from Genworth’s Cost of Care Survey. It’s important to note that assisted living rates in Sumner and the surrounding suburbs can vary widely based on factors such as location, the level of care needed, apartment size and the types of amenities offered at each community. Some seniors may be eligible for financial assistance through the Home and Community Based Services Elderly waiver, offered through the state's Medicaid program. Although it can't be applied directly to ALPs, this waiver can help mitigate the costs associated with assistance services and can be self-directed to allow seniors to hire friends or family members as caregivers. 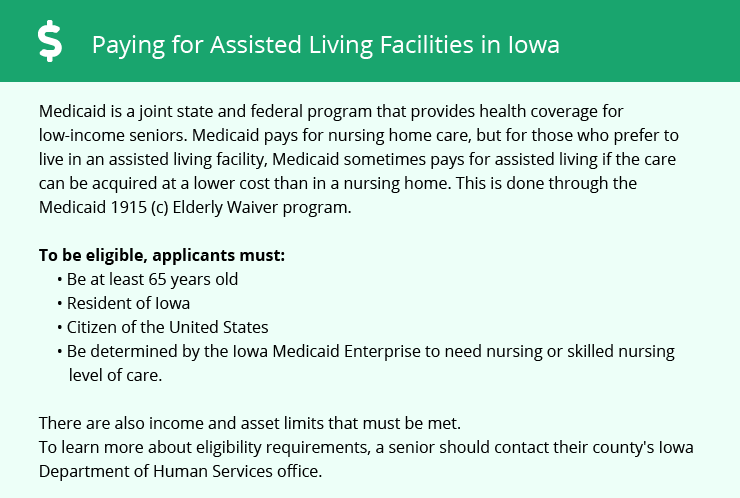 Learn more about these programs, plus who’s eligible, on our Assisted Living in Iowa page. For more information about different ways to finance assisted living, visit our Assisted Living in Iowa page. Sumner and the surrounding area are home to numerous government agencies and non-profit organizations offering help for seniors searching for or currently residing in an assisted living community. These organizations can also provide assistance in a number of other eldercare services such as geriatric care management, elder law advice, estate planning, finding home care and health and wellness programs. To see a list of free assisted living resources in Sumner, please visit our Assisted Living in Iowa page. Sumner-area assisted living communities must adhere to the comprehensive set of state laws and regulations that all assisted living communities in Iowa are required to follow. Visit our Assisted Living in Iowa page for more information about these laws.